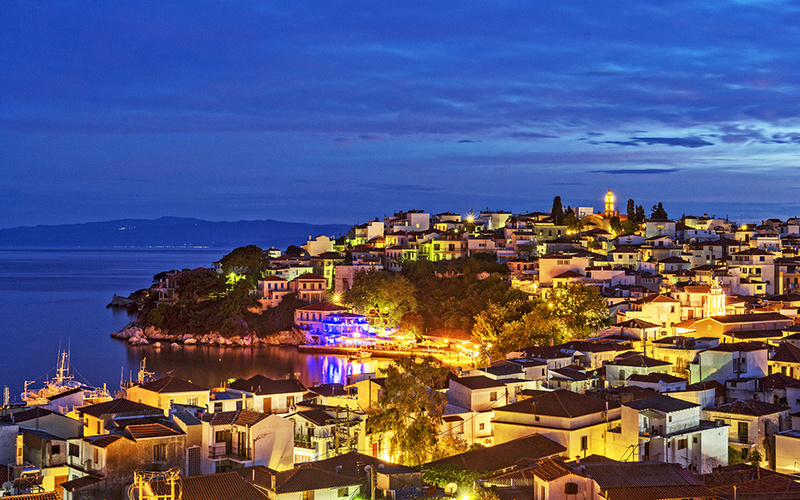 Small but truly gorgeous, Skiathos, the most renowned and developed of the Sporades Islands, promises a spirited nightlife, gourmet spots and modern hotels. 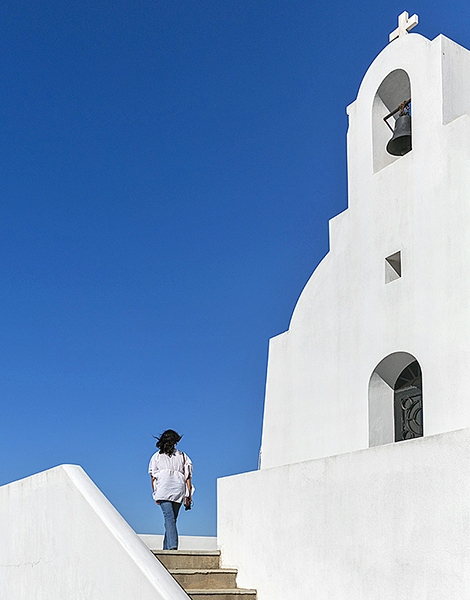 This destination, located in the western part of the Aegean Sea, also features protected nature zones, serene beaches, and a host of wonderful surprises. 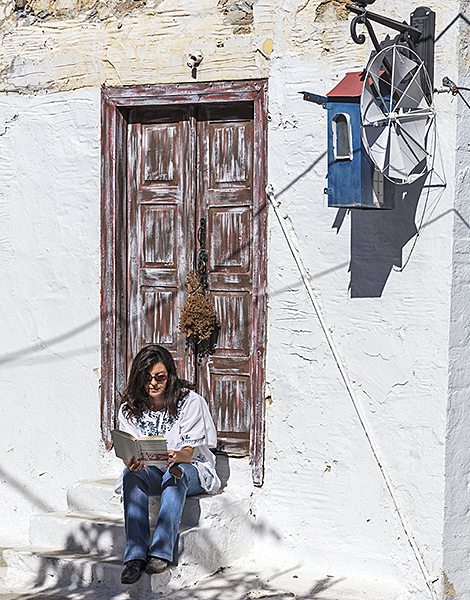 Begin your visit with a stop at the residence of celebrated 19th century Greek writer Alexandros Papadiamantis, who was born and raised on the island and returned here to spend his latter years. Located amid the alleys opposite the port, the modest house, nowadays a museum, testifies to the writer’s quiet and frugal lifestyle. A gift shop selling titles by the author operates here. Exploring Bourtzi, a densely vegetated peninsula protruding from the port and dividing it in two, is also recommended. You should keep in mind that, apart from these two serene exceptions, the rest of the island’s main town is saturated by tourism. 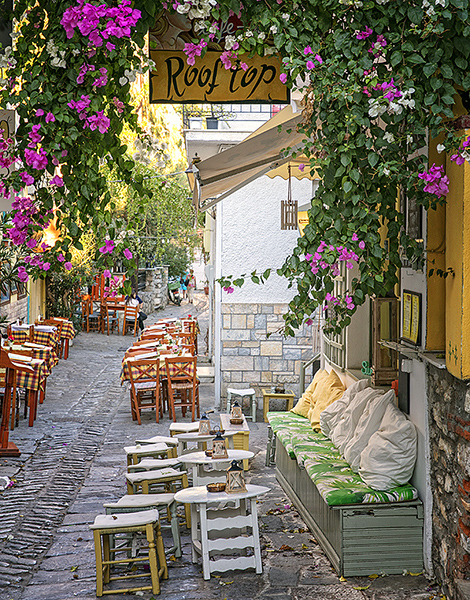 In summer, the capital is flooded by the inflow of charter flight traffic; the many tavernas, restaurants, rooms for rent and modern hotels are always busy, and there’s loud music at café-bars from the early afternoon hours. It’s very likely that you’ll end up spending a few late nights at one of the many clubs here. For a quieter evening, opt for the town’s open-air cinema. The musical/romantic comedy “Mamma Mia,” starring Meryl Streep and filmed in the Sporades, is featured regularly at this theater. 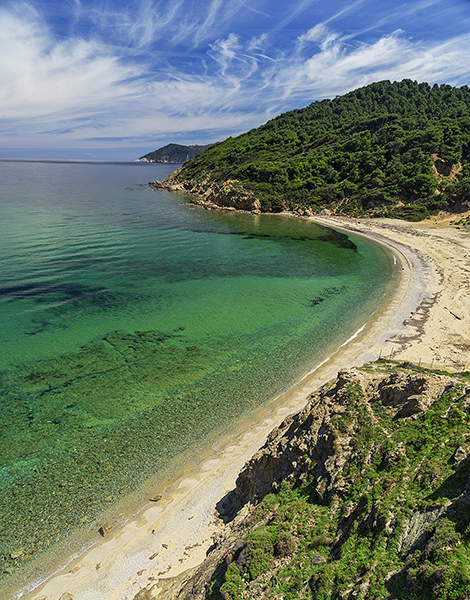 Discover the island’s “rosy coastline”, as Papadiamantis often described the 60-odd wonderful beaches of Skiathos. Go swimming at Koukounaries, a world-renowned beach also known as Hrysi Ammos (Golden Sand), and top off your day at the shore with an afternoon cocktail. Explore nearby Strofilia Lagoon, a protected wetland that’s home to rare plants and birds. 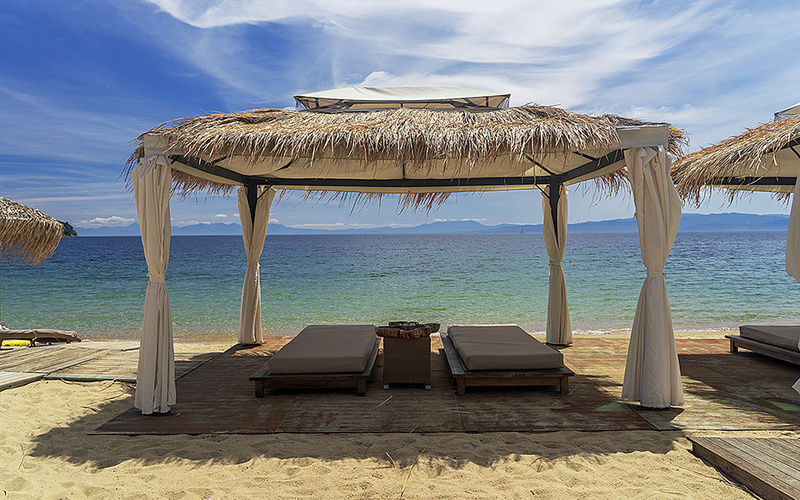 Check out Banana Beach, filled with pines and featuring a trendy beach bar. The adjacent Mikri Banana (Small Banana) Beach is a quieter, more detached spot. 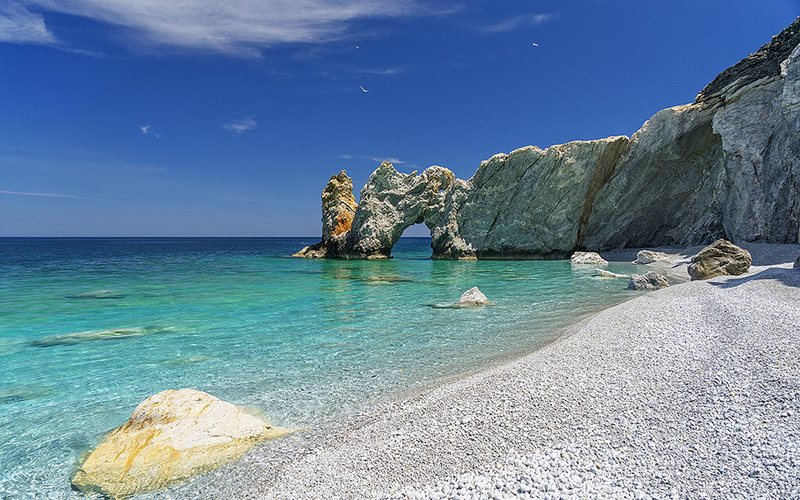 Other Skiathos beaches worth visiting include Mikro Aselino, Megalo Aselino, Mandraki, Elia, Aggistro, and Lalaria; this last spot is an unrivaled stretch of turquoise waters and smooth, rounded white pebbles. There’s also the much-photographed Trypia Petra Beach, which can only be reached by boat from the port, weather permitting. Take off for a one-day cruise on a yacht or small boat. Many vessels embark from the port on a daily basis for the islets of Tsougria and Arko. A small taverna operating on the beach at Arko resembles a pirate hangout. Some intrepid yachtsmen like to sail further, all the way to the turquoise coast of the island of Skopelos, about 20km away, or to the cave on the islet of Dasia, a fabulous stopover for a refreshing dip in crystal-clear waters. Visitors who want to follow up the one-day cruise with further sea adventures may consider a trip to the National Marine Park on the island of Alonissos, 49km from Skiathos. This park was established to protect the Mediterranean monk seal (Monachus monachus) and its natural habitat. From Alonissos, it’s also possible to take a boat to the uninhabited islets of Kyra Panagia and Psathoura. Skiathos may be reached via hydrofoil service on the Flying Dolphin line (1 hour) or ferry-boat service (3 hours) from the town of Aghios Konstantinos, which is a 2½-hour drive from Athens. From Thessaloniki, the island may be reached by hydrofoil (4 hours). Boat service is also offered from Evia and Volos, and flights are available from the Athens airport (40 min). 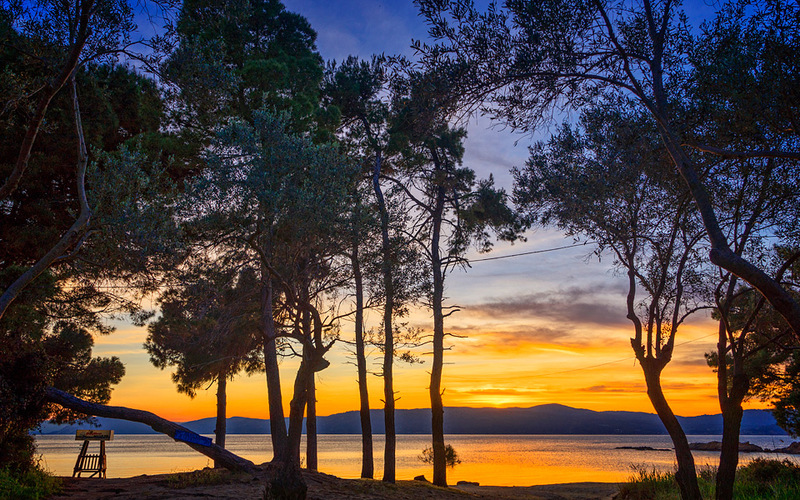 Explore the serenity of northern Skiathos. The degree to which this side of the island has remained untouched by mass tourism is impressive, and so is the resultant tranquility. Many foreigners own holiday houses here and have devoted themselves to protecting its nature. Not a single hostel or room for rent is on offer in the north. There are, however, plenty of things to see and do: visit the Evaggelistria Monastery, the Magiko Dasos (Magic Forest) and the dilapidated Venetian castle suspended above the sea. Try some kritamo (sea fennel) and a serving of sun-dried octopus at one of the tavernas operating in the area. Follow the shady trails. Hiking on this densely vegetated island remains pleasant even during the hot summer months. Of course, early morning and late afternoon hours are best. Contact Hiking on Skiathos, a nature lovers’ and hiking club that organizes expeditions. Those who manage to cover all the island’s 25 marked hiking routes, which together measure a total of 200km, are awarded an “Alexandros Papadiamantis Hiking Medal” by the municipality of Skiathos.